His nose twitches constantly. Lamp posts cannot be resisted. Another slimy chicken bone taken out of his mouth. This is my regular two-block walk from the office to the train station. I have a very sweet, sometimes naughty, Labrador Retriever guide dog named Weller. He is a gorgeous dog with long ears, a sharp nose and a long feathery tail. His coat is shiny black and he’s very sleek and graceful. We had our issues, but nothing that was too terrible. Then one summer things changed. I don’t know if it was the crowds of people downtown that were not very careful about where they throw their garbage. Maybe it was the homeless people who enticed him with food as I passed by. It could have been the many dog distractions we encountered because of the increased number of pet dogs downtown. Anyway, things took a turn for the worse. Weller couldn’t keep his nose off the ground. He would stop dead at every lamp post, flower pot or garbage can, and I would go tumbling over my two feet. Dog distractions would have him turning 180s. The herky-jerky travel wasn’t the way I traveled with my previous guides. Our trips every day to the office became a challenge and not much fun. I worked with my instructor from Guide Dogs for the Blind on ways to eliminate these behaviors. We tried lick sticks, high-value food rewards, bananas — but nothing seemed to work. So When is it Time to Give Up? I debated that question for many months. Contemplating between the status quo and the time it takes to build that strong bond with a new guide brings on a teeter-totter of emotions. Thinking about the time it takes to go to guide dog school – time away from work, family and friends – reminds you it is a pretty big decision to make. Knowing about the time, expense and effort it takes for a dog to become a guide makes you want to do everything you can to make it work. But if you don’t feel safe, that’s when it’s time to think good and hard about this decision. And, that’s what finally made me throw in the towel. I was beginning to not feel safe traveling, especially in crowded downtown. A lamp post positioned right before a driveway for a parking garage next door to my office building was a beacon for Weller. I felt he wasn’t paying attention to cars that may be pulling in or out of the garage. I no longer felt comfortable going places outside of our daily travel routine. This really limited my independence. 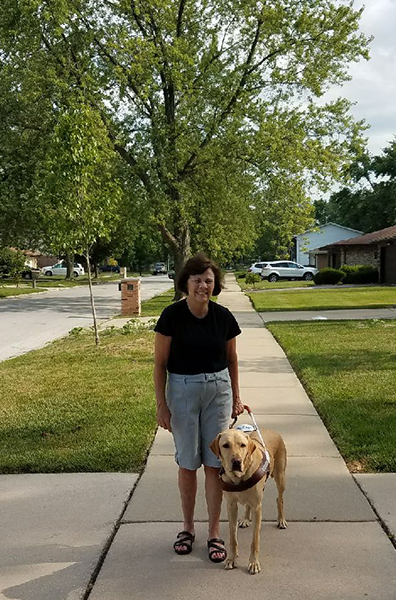 Part of the pleasure of working with a guide dog is the ability to travel off your beaten path or to places you don’t go too often. Weller also began scarfing up all sorts of “goodies” off the sidewalk. I was becoming fearful he would eat food that would be dangerous for him. 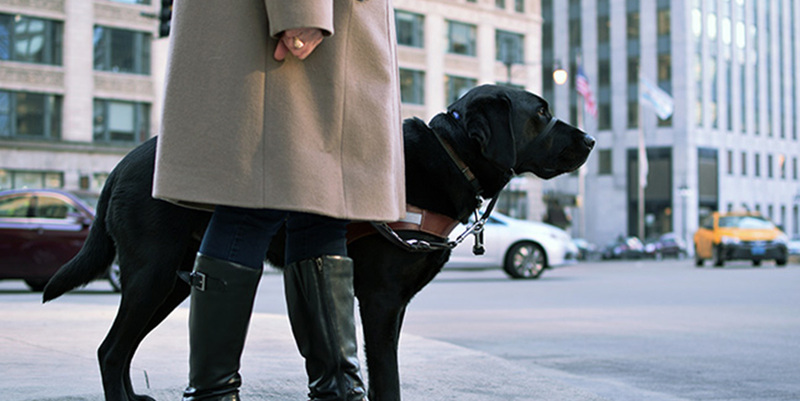 It is fun to work a guide dog – the mo-jo you feel when you glide down the street is an amazing feeling. But when it’s not working, it’s a struggle. So I made the decision. I didn’t want to travel like this anymore. Weller retired after two years and 10 months. I don’t think his heart was it anymore – neither of us was having fun. 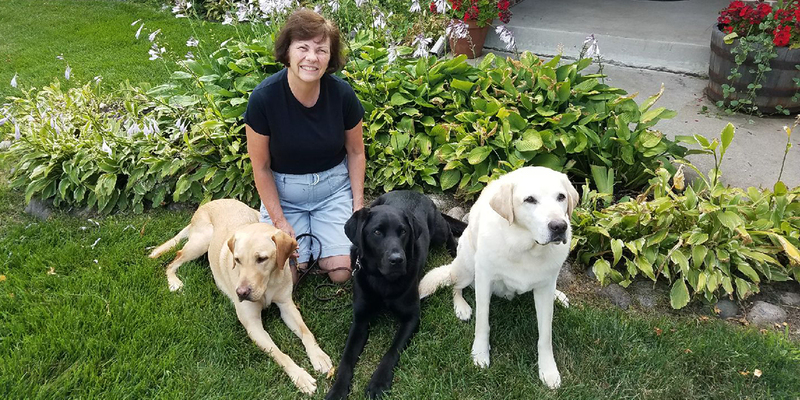 Weller is now living at home with my family, my 11-year-old retired guide dog, Solomon, and my new guide Rowen. I think he’s still figuring things out but he seems to be happier now. As for me, my new guide is working out well and I’m getting back some of that mo-jo! Kathy is the Community Engagement Specialist at Second Sense. She started working with Jethro, her first guide dog, in June 2002. Rowen is her 4th guide dog. Thanks, Susie. It was a hard one to write. True and timely. My DH guide, Wrangler, constantly stops, sits and won’t go until DH takes the harness off, lets him circle, and put it on again. Every half mile or more often. We walk with a walking club and he is always last. I don’t think the dog wants to work anymore.